Program notes:	Tarjeta 4 was written for the 2011 UPBeat festival, which took place in Milna, Croatia. In this work, I further explored the use of magic squares as a compositional determinant and utilized Peter Maxwell Davies's pitch square from Ave Maris Stella. 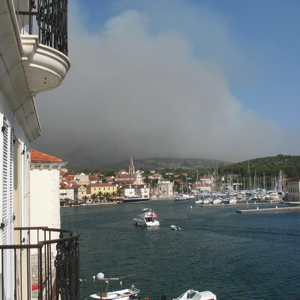 While in Milna for the festival, a large wildfire swept the island and came very close to the town. The picture to the left is from the hotel where I was staying and the billowing smoke is from the fire.